The city of Chicago as you may know has two major airports served by commercial carriers, O'Hare and Midway. Midway, the older and smaller of the two serves regional and national destinations and is dominated by Southwest while O'Hare is a hub for American and United and serves both national and international destinations with regional feeders. At about 20 miles apart, the two airports are very close from an air traffic point of view and present special challenges for the volume of traffic each airport handles. This job falls to the FAA's organizational level of approach control (tracon) for the Chicago area known simply to pilots as "Chicago Approach". There's a story here involving the death of a six year old boy, but first some background. The FAA organizationally divides their controllers into three general categories of tower controllers, approach/departure controllers and regional controllers or "Air route traffic control centers". On a routine flight, an aircraft would get taxi and takeoff instructions from tower controllers, local departure routing from the departure control (who are the same people as approach control) and after climb to altitude, routing from the regional center. So say on a flight from St. Louis to Midway an airliner would start by talking to St. Louis Lambert ground and tower controllers. After takeoff, the aircraft would talk to St. Louis departure control for the climb to altitude and then be handed off to Kansas City Center for enroute control. The aircraft would be handed off to Chicago Center when crossing the boundary into Chicago's airspace who would issue initial descent clearance. As the aircraft descended below the center's airspace, it would be handed off to Chicago Approach who would vector it for an approach at which time it would be switched to Midway tower who would issue landing clearance followed by Midway ground control who would issue taxi instructions to the gate. The system works, albeit inefficiently, is safe, and has been in use now for about 50 years. That's right, 50 years. 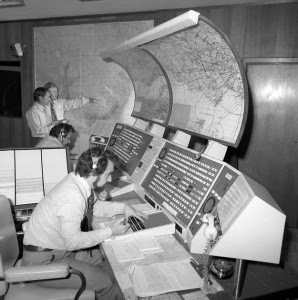 The current air traffic control system in the United States is essentially the same one that was used to guide TWA and Pan Am 707s back in the 60s. Oh sure there have been some upgrades and technology improvements in things like communications and radar, but the operational concept of an air traffic controller with a radar individually controlling airliners through radio calls is the same as it ever was since the dawn of the modern air transport era. In fact, my description of a routine flight above could've been lifted directly out of one of those old Time-Life technology books that used to sit on my parent's bookshelf as I was growing up back in the '60s. The history of the US government's attempts to update the ATC system is long and expensive, running into tens of billions of dollars over the past few decades with little to show. Starting in the 1980s the FAA implemented a plan called the Advanced Automation System which was projected to cost $2.5 billion but ended up years delayed and costing $7.6 billion even after parts of the program were abandoned. The FAA blamed the shortcomings on federal personnel and procurement constraints. While there have been efforts to reform the bureaucracy to make the FAA into a performance based organization they have met with limited success. These have included reforms such as having air traffic services overseen by a board of directors and managed by a chief operating officer. In 2000 Congress passed the Aviation Investment and Reform Act for the 21st Century (AIR-21) to facilitate some of the recommended changes and still the bureaucracy managed to stifle reform in a classic turf battle over the responsibilities of the FAA administrator and the proposed air traffic COO according to a GAO report. The picture that continually emerges is that the FAA is a stubbornly recalcitrant bureaucracy resistant to performance enhancing change and the air traffic control system reflects this reality. In 2003 as a result of some of these criticisms and cost overruns, Congress passed and President Bush signed into law the Vision 100 - Century of Aviation Reauthorization Act. This law established the Joint Planning and Development Office whose mission it is to manage the design and implementation of what is now known as the Next Generation Air Transportation System (NextGen). Coordinating between a half dozen federal agencies such as the DOT, FAA, DOD, Homeland Security, Nasa, and private industry, NextGen is the government's latest (and final?) drive to hopefully achieve the elusive update of the National Airspace System. Fast forward 10 years and some tens of billions of dollars later, and we are on the cusp of a new era of aircraft control. Utilizing updated technologies such as GPS navigation, advanced computer processing power, and communications, the hope for the NextGen system is to finally revolutionize air traffic control into a highly automated control system for commercial air travel. The benefits to such a system are manifest. They include substantial fuel savings with a concurrent reduction in emissions, significant improvement in the utilization of current airspace resulting in fewer delays and increased airspace capacity, along with the use of advanced computational tools for efficient weather avoidance and traffic conflict resolution. All of these goals are considered to be necessities as traffic projections show the current system to be at capacity. One of the ways that the NextGen airspace system more efficiently uses airspace is to fit more airplanes onto more closely spaced routes. This is accomplished using highly accurate, GPS guided, automatically flown routes. This system of automated flying, known as required navigational performance or RNP, puts airplanes on precise pre-determined routes from departure through approach and not only prescribes their horizontal position but vertical as well. When we talk about precise aircraft positioning, RNP compliant aircraft are required to keep their horizontal position accuracy to within 0.1 nautical mile minimum and vertical position accuracy under 100 feet. Most aircraft do much better than that. Once placed on track, airplanes will fly a precise path through the air needing very little outside attention. Oh, and one other result of the automation of aircraft routing through RNP: fewer controllers. The Professional Air Traffic Controllers Organization (PATCO) was formed in January 1968 and it took only two short years before they orchestrated their first of many job actions by staging a sick out over wage and benefit issues. Patco is most famous though for their run in with the newly elected President Ronald Reagan in 1981. In August of that year after failing to reach an agreement with the FAA, 12,300 Patco controllers went on strike grounding much of the nation's air traffic. Reagan responded by firing all the striking controllers after a 48hr warning. Patco disbanded and the FAA's controllers were without union representation until 1987 when a new union, the National Air Traffic Controllers Association (NATCA) was formed. With average compensation of controllers on the order of $150k, more than many of the pilots flying the planes they control, the FAA has more than ample incentive to reduce their labor costs through the use of automation. Even though controllers hired in the wake of the Patco strike are reaching retirement age, controllers still on the job are apparently not thrilled about automation reducing their ranks. This is simple human nature. People naturally place value on what they do for a living and being replaced by a machine does little to enhance that value. The night of December 8, 2005 was a snowy one in Chicago. A winter storm was moving through the area and Midway airport was experiencing low visibilities and heavy snow. The wind was blowing from the southeast which would normally mean that aircraft would be landing on the southeast facing runway to land into the wind. On this night however, Midway bound aircraft were landing to the northwest on runway 31C with a tailwind. There was a good reason for this on this particular evening and that was that the visibility was not good enough for the approach to the southeast runway while it was good enough to land to the northwest with a tailwind. Tragically on this night, a Southwest 737, Flight 1248, failed to stop on the pavement and crashed through the airport perimeter fence into the intersection of W. 55th St and S. Central Avenue hitting the car in which Joshua Wood, 6, was riding killing him. It is the only fatality ever to be attributed to Southwest Airlines in it's entire history. The NTSB, in their investigation noted among other things that if not for the tailwind, the aircraft could've stopped within the confines of the runway, snow notwithstanding. Tailwind landings, though not optimal, are not inherently dangerous unless other factors come into play such as runway length or slippery pavement. One reason pilots prefer to land into a headwind is that a headwind approach reduces the speed that the aircraft is travelling over the ground while a tailwind increases it. And as the amount of kinetic energy varies with the square of the velocity of a moving object (KE=1/2MV2), a little tailwind means a lot more energy must be dissipated on the runway by the brakes and reversers. The snowy short runway. Midway's main runway is only about 6500 feet long - relatively short for airliners - and Midway did not have a proper "overrun" or pavement extending past the runway due to the age of the airport allowing it to be grandfathered past safety regulations requiring such pavement extensions. But, there was another reason that played into why Midway was landing to the northwest that snowy night. It was this: they almost always landed to the northwest. Unless the tailwind increased to more than 10 kts which is the allowed limit, Midway favored runway 31C, the northwest facing runway. The reason for this? O'Hare. O'Hare is a mere 20 miles northwest of Midway which is nearly next door as far as airliners are concerned. Flying an instrument approach into Midway would put them right into the O'Hare departure corridor. For airliners to fly an instrument approach to Midway's runway 13C, they must impede on O'Hare's airspace which of course greatly complicated the controller's jobs. Or at any rate they used to. Any instrument approach is simply a way to get an airplane through the clouds to land on a runway. Since the early days of aviation, the only available way to do this was with radio waves. Airplanes tune into a directional radio beacon and follow it to the runway. The problem with radio waves is they don't bend. Any approach which followed a radio beacon was by definition a straight-in approach. RNP has changed all that. Part of the brilliance of NextGen and RNP is that aircraft no longer depend on ground-based aids to navigation, i.e radio beacons. GPS and onboard equipment provide the navigational information used to direct modern airliners. Once freed from the tyranny of the radio beam, and given automation tools and autopilots which can fly a precise route, approach designers were free to construct what has long been an elusive goal: the curved approach. What this meant is that two close airports were no longer stepping on each other's toes. No longer would airspace issues determine traffic patterns over safety concerns such as tailwind landings. At least that's the dream. Now the reality. Southwest in 2011 became one of the first airlines to install the equipment to become fully RNP compliant. This effort consisted of millions of dollars of advanced equipment to be installed in aircraft and millions more dollars in training costs for its pilots. The FAA for its part was to design and certify the many RNP compliant approaches and then allow the RNP aircraft to utilize them to their mutual benefit. But a funny thing happened along the way to the future of aviation: nothing. After a brief period where Southwest required its pilots to log RNP approaches for initial qualification they found that controllers simply didn't want to offer those approaches on the grounds that it was difficult to sequence RNP aircraft in with non-RNP aircraft. And rather than giving the RNP compliant aircraft priority, they simply got in line with everyone else, like they always had. This has been a common complaint among airlines which have upgraded to RNP..
And nine years after the crash of Southwest 1248, Midway got it's first RNP arrival and an RNP approach to runway 22 which previously had no approach but relied on pilots executing a visual circling maneuver to land when the winds dictated. But this is Chicago. Change happens when the shop steward says it is going to happen apparently. Having recently flown the new arrivals, we can attest to this new reality. While flying into Philadelphia or perhaps LAX might entail one instruction from the controller to fly the entire procedure with no further input, the Chicago controllers we've encountered are happily oblivious to all this spending as much time micro-managing aircraft as they've ever done. It's as if nothing has changed at all. And this was born out recently by a conversation with a Chicago ATC manager who relayed that the issue is the perceived threat to jobs by the very controllers who are entrusted to implement the future. So the next time you find yourself on a ground delay while waiting to take off to Chicago, remember, it's the Chicago Way. Very nicely authored, a quite complex system distilled into an understandable explanation. I had always wondered why with all the advances in navigation and advent of GPS in other disciplines, why commercial avionics seemed behind the curve. Let's see: corporate economics, federal regulations encroaching on corporate innovation, the coersive nature of government power, an inside-baseball look or the airline industry, the corrosion of our personal liberty....This must be another one of Rob's posts! Keep up the great work, my Captain.